Square Enix can be a little sporadic when it comes to handing out screens of their upcoming titles, but when they do get around to it they do it up big. How big? 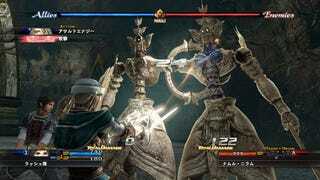 They've just dropped over 70 screenshots for The Last Remnant, covering all the bases. It's so large we had to split it into two galleries, one dealing with the characters and encounters in the game, and another that covers bosses and storyline moments. I'm really digging the style of Remnant, though after the pile that was Infinite Undiscovery (which should have had Saga at the end) anything else comes out looking like a work of art. Without further ado, here's enough pretty pictures to keep us occupied until the game's November release.